That said, while WordPress automation is a good thing, it typically comes in the form of a plugin… which is why this can get a little tricky. As you know, WordPress plugins can add some serious weight to a site, so you don’t want to overdo it. But if you get the right plugins in place, you won’t have to worry about any degrading side effects to your site’s performance. So, let’s take a look at all the ways you can automate WordPress as well as how you should set up each of these processes. If you replace “jobs” with “tasks”, I think that’s a wonderful outlook to have for the state of working with WordPress. Imagine having to spend 50% less time on the menial tasks that detract from the real work you should be doing. Of course, that’s not to say that those tasks are unnecessary to your workflow and aren’t “real” work. It’s just, why waste your time on them if a piece of software can do it more quickly and efficiently? And that’s what we’re going to look at right now: all those WordPress website processes that can and should be automated on your website. It’s essential to keep the WordPress core as well as any themes or plugins on your site updated. If you fail to make these updates–or even if you fail to do so in a timely fashion–your site could suffer some serious consequences (usually as it pertains to security). So, if you decide to pick-and-choose which of these tasks to automate in WordPress, this should definitely make your list. To automate the updates process, get acquainted with Automate. Upon activating this tool, you can choose how much or how little you want to automate the updates process. It also comes with a neat reporting feature, so you can be informed of all the updates happening on your site (even if you didn’t have a hand in doing them). There are a number of ways in which you can clean up and optimize your WordPress site. While most of those tasks require direct input and action taken by you, there is one very important task you can automate: database cleanup. With a plugin like WP-DBManager, you can schedule the automatic backup, cleaning, and optimization of your site’s database. This isn’t always the most exciting or even easiest of tasks, so it’s nice to have a plugin to relieve you of that responsibility. Your database isn’t the only thing that needs a backup. If you want to ensure your site’s content is preserved somewhere outside of WordPress in case you need to quickly restore your site to its last-saved version, regular backups are necessary. Of course, these take time to manage (and to remember to do), which is why you should automate this with a plugin. The first backup tool you should use is Automate. With it, you can schedule a backup prior to any updates being made to your site. The second backup tool which you should use for more predictable and regular backups is a WordPress plugin. 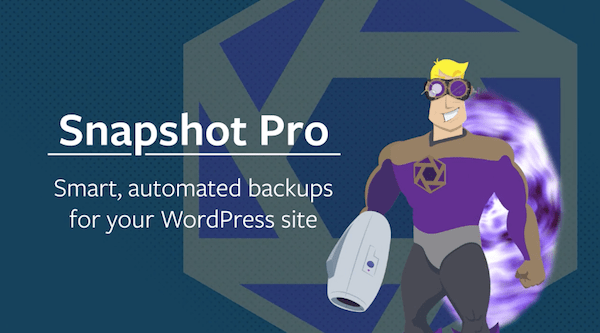 You have a number of quality backup plugins to choose from, but you should start with Snapshot Pro if you have a WPMU DEV account. When it comes to securing your WordPress site, you can never have too much security in place. As you can imagine, this can occupy quite a lot of your time, which is why automation is going to be key here. Automation also allows you to peek behind the scenes to scope out whether someone’s infiltrated areas of your site that aren’t readily visible. It’s definitely a huge help. As far as automating WordPress security, you won’t be able to do so with every task on your security checklist. However, there are some parts of it that can be automated through WordPress tools and plugins. WP Checkup, for instance, is an awesome tool you can use to automatically scan and sweep your site (with your WPMU DEV membership, that is). You can also use a WordPress security plugin. Another type of security and threat protection you can automate is spam blocking. With a WordPress plugin like Akismet, you won’t have to worry about sifting through comments submitted to your blog to try and identify the bad apples. The plugin will take care of the heavy lifting, so you can focus on the valid and valuable comments left by your followers. By now, you know that your site’s speed really should never go beyond a three-second load time. Anything more than that and it’s time to do some serious cleanup before you start noticing a huge increase in your bounce rates. Thankfully, you can automate much of this performance monitoring and cleanup work with WordPress tools. First, you should be using WP Checkup to scan your WordPress site’s performance. It will let you know all the ways in which you can speed up your website. Next, you’ll need to install a caching plugin. A caching plugin does more than just cache your site’s content and keep HTTPS requests to a minimum. In fact, with a performance plugin like Hummingbird, you can automate both the monitoring and optimization tasks required to keep your site running along at top speed. Technically, image optimization is a type of performance optimization. Rather than focus on files and scripts that can bog your speed down, though, image optimization plugins automate the compression of your site’s media files. If you’re not using the Smush Pro plugin yet, what are you waiting for? With this plugin, you’ll never have to worry about resizing or compressing images on your own again. As I was writing this SEO tutorial recently, I realized how much work actually goes into the optimization of a website for search. The problem isn’t that there’s that much to optimize to start, it’s more that you need to carefully review your progress in search–and much of that depends on what sort of message you’re sending to the search engines. The first is the scanning of the SEO setup on your site. You can do that with the WP Checkup tool from WPMU DEV. The next kind of automation you should have in place is the creation of and transmission of updates of your XML sitemap to search. You can do this with an SEO plugin like SmartCrawl. And, finally, you should be using an SEO tool to check your Google keyword rankings. Once you set your site and keywords up in the tool, you can automate what kinds of notifications you receive about your standings and at what frequency you receive them. In order to keep your site fresh and relevant, you should be blogging on a regular basis. While you can’t outsource the creation of that content to a tool (though you could always outsource to a person), you can automate the scheduling of that content. 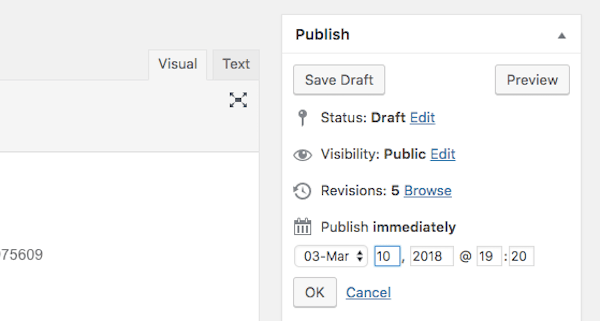 All you have to do is set the future date and time when you want it to publish, press OK to save the settings, and then press the Schedule button (which was previously a Publish button). Once you have content that’s published to your site, you don’t want to leave it up to chance that people stumble upon it. You want to actively promote it on social media. Of course, though, that requires some effort on your part. In order to automate this process, you will need a WordPress plugin. Jetpack is a good free option to start with if you can find some use for the other features in this jam-packed plugin. With this one, all you’ll need to do is connect your social media accounts to WordPress and set each post to automatically get promoted on each platform once it goes live on the site. Your other option is a premium plugin like CoSchedule, which is more of a content planning and scheduling tool. Once installed, you’ll have a content calendar you can work from in WordPress. Unlike Jetpack, however, you can write totally custom messages to share on social media at a later date and time. When you spend so much time crafting high-quality content for your WordPress site and devising an internal link structure that’s sure to improve your SEO as well as the visitors’ experience, you don’t want that to go to waste. While there are a number of ways in which content can be compromised, one of the easiest ways to protect against that is to use a broken link plugin. Rather than comb your site for the errant broken link, use the Broken Link Checker plugin to automate the process. Then all you have to do is watch for the broken links to appear in your widget and repair them on the spot. Running an e-commerce site takes a lot of work. You need to keep your product inventory or services continually updated. You have to run regular promotions to lure visitors and customers back for more. And you have to do everything else that non-commerce sites have to deal with. It’s tough. That’s why it’s nice that you can automate the process of collecting payments with a payment gateway tool. There’s absolutely no need for you to run anyone’s credit card, deposit a check, or any of the other types of payment collection activities retailers had to deal with a decade or two ago. So long as you have a reliable gateway to handle it, you can wash your hands of that responsibility. Do you remember the days before email when you actually had to call a business or visit their storefront if you wanted to talk to someone? Yeah, I don’t like to think about that much either. Luckily, email tools like Gmail and Outlook now give us the ability to have entire conversations with customers and prospects online. The initial intake information you collect from visitors. The notification relay of these messages from the site to your inbox. The response visitors receive after they’ve used one of your contact forms. And all this is possible thanks to contact form and lead generation plugins like Hustle. If you’re taking the time to craft blogs for your WordPress site as well as to collect leads from your contact forms, then you should also make time for sending newsletters to followers. In some cases, you don’t even have to write any content. With the right newsletter plugin, you can automate it to pull in content from your site or to send auto-generated messages whenever new content publishes. Data collection is arguably one of the most important processes that happens for any business. When it comes to websites, there’s really only one tried and true method we should rely on and that comes from Google Analytics. That, in and of itself, is one of the greatest automations we have at our disposal. Simply add a tracking code to WordPress using a Google Analytics plugin and then let it pull in data related to your traffic. While these plugins typically don’t automate Analytics reports for you, you do have the ability to set these up within Google Analytics once the tracking code is in place. As you can see, there’s a lot that can be automated within WordPress to ease your workload and improve your workflow in the process. Without the help of these WordPress tools or plugins, much of this wouldn’t be possible. But, again, it’s important not to get too plugin-crazy here. The more plugins you install on your site, the more of a drain it will be on your server. So, choose your automations wisely.